Dr. A.B. 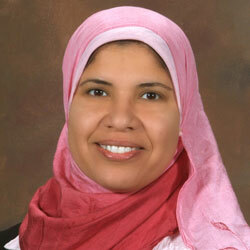 El-Remessy is Associate Professor of College of Pharmacy, University of Georgia (Tenure) from 2011-present. She received her M.S in Biochemistry from theMansoura University in 1995. Dr A.B. El-Remessy received his Ph.D. in Ophthalmology from Mansoura University in 1999. She was a post-doctoral fellow at the Medical College of Georgia from 2000-2002 in Vascular Biology. DrA.B. El-Remessy has served on many NIH, AHA, AA, JDRF review panels, has reviewed for many journals and is currently on the editorial board of 2 journals.